Will Derek Carr and the Oakland Raiders prevail over Marcus Mariota and the upstart Tennessee Titans? Both the Oakland Raiders and the Tennessee Titans are on the rise. Both have young quarterbacks who can take over a game at any time. Both have smash-mouth running backs who play with a chip on their shoulder and each team also has a talented group of receivers that find the end zone consistently. The defenses for both teams need work, but there is no question that both of these teams should challenge the New England Patriots in the AFC. The two square off in Week 1 and it should be an entertaining game with firepower on both sides. The Oakland Raiders finished last year 12-4, but the season was a disappointment. The season for the Raiders essentially ended with the broken leg injury to Derek Carr. While Oakland still made the playoffs, they were bounced easily by the Houston Texans. Nonetheless, Carr is healthy and ready to lead Oakland to the playoffs in 2017. 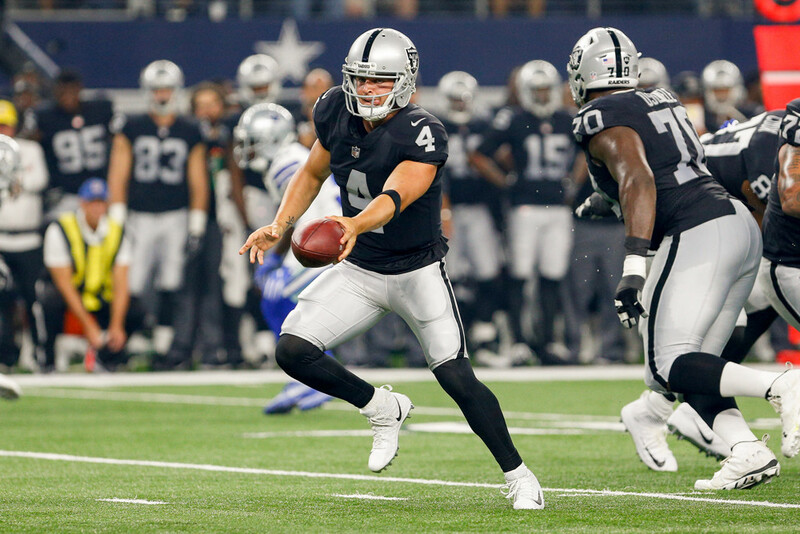 Derek Carr should bounce back in his first game since the injury. Tennessee ranked 30th in pass defense last season and while they did sign CB Logan Ryan, the unit won’t be overly impressive in 2017. Expect Carr to exploit the Titans defense for 310 yards, two touchdowns, and no interceptions. He’s back! Marshawn Lynch is beloved by fantasy fans everywhere, and they are especially excited about his landing spot this offseason. The Raiders have an extremely talented offensive line that should open holes for Lynch. Despite this, this is Beast Mode’s first game since 2015, so I expect the touches to be limited. I think he gets 16 carries for 65 yards and one touchdown. He also gets 2 catches for 15 yards. The breakout is inevitable for Amari Cooper. One of the highly touted players in dynasty drafts, Cooper is slated to actually take over the #1 wide receiver role, despite being out-produced by Michael Crabtree the last few years. I can see Sunday being the beginning of the breakout for Cooper. I think he burns Tennessee for 7 catches, 110 yards, and a touchdown. One of the most disrespected receivers in fantasy, Michael Crabtree still has potential to emerge as the top threat for Derek Carr. Crabtree gets the job done in the end zone and is the classic possession receiver that quarterbacks love to have. He starts off 2017 with a bang. I think he gets 8 catches for 90 yards, but no touchdowns. The offseason acquisition of Jared Cook is overlooked sometimes, but the fantasy community has to remember the real Jared Cook. He has shined in some games, but during his career, he has mainly disappointed fans with dud games as well. Expect that to happen this year too. He starts off 2017 with 4 catches for 35 yards and no touchdowns. The Titans finished 2016 with a 9-7 record and narrowly missed the playoffs. Marcus Mariota (like Derek Carr) broke his leg towards the end of the season and even if Tennessee were to make the playoffs, they would not have competed anyway. 2017 looks bright for the Titans. With a maturing quarterback, an elite run game, and weapons on the outside, the Titans look primed to be this year’s breakout team. As mentioned above, this is Marcus Mariota’s first game since the leg injury, so it will be interesting to see how his mobility is affected by the injury. I predict we will still see the same Mariota. Oakland ranked towards the bottom of the league in pass defense, but he will have to deal with Khalil Mack coming off the edge. Despite that, the offensive line should keep Mariota sturdy. I expect 230 yards, two touchdowns, and one interception for Mariota. He also gets 40 yards on the ground as well. After being dead to fantasy owners a year ago, DeMarco Murray is back to being one of the work horse backs that everyone wants to own. Even with competition behind him, the coaching staff has supported Murray and said that he is the guy. While I think the workload in his career affects him this year, he will still put up RB1 numbers. This week is no different. I expect DeMarco Murray to finish with 22 carries for 130 yards and a touchdown. He also gets 4 catches for 30 yards. Derrick Henry is a player that most fantasy fans wish was on a different team. If Henry was on a team that struggled to run the ball, his fantasy value would skyrocket. Henry is uber-talented but won’t make a huge impact unless DeMarco Murray gets injured. That being said, Henry will get some touches and has a chance to score on the goal line. I don’t see it this week, as I think he gets 12 carries for 45 yards, and no touchdowns. The wide receiver position is a conundrum for the Titans. There are multiple guys who can emerge as the #1 threat. One of the guys was just signed this offseason in Eric Decker. Hyper-efficient in the red zone, Decker has always been a touchdown machine during his time in the league. Tennessee needed a receiver like Decker and he will do well in Tennessee. I think he gets 5 catches for 60 yards and a touchdown on Sunday. Delanie Walker has had back-to-back great years in Tennessee with Marcus Mariota. While there are more mouths to feed on offense, Walker has always been the outlet for Mariota. He will control the intermediate portion of the field for the Titans, as the other receivers for Tennessee are more big play type of guys. I expect Walker to get 7 catches for 55 yards, but no touchdowns.